Buying a toilet is not as simple as it used to be a decade ago. Today, toilets are much more advanced and have so many unique features. This is especially true if you are looking for a toilet to install in an RV. These toilets are a bit different from the ones you would find in homes or offices. For this kind of toilet, you have to look for something that is not only functional but also compact and durable. When it comes to buying a toilet, the flush system is of the utmost importance because, in a small space like an RV, you need a toilet that quickly flushes and cleans too. Also, the materials used should be high-quality. Otherwise, you would be looking at frequent repairs or a replacement altogether. As for the size, you need to determine which one you need depending on your requirements. Most of them are small in size as they are a single-piece type of toilet. Nevertheless, it is important to make sure you are getting an adequate enough size, especially the seat. A small seat may be uncomfortable to use. One such toilet that is designed specifically for installation in campers is the Thetford 34429 Aqua Magic Style Plus. Let’s examine its features in details to see whether it is worth putting in your RV. Thetford is a relatively newer company for camper and RV toilets, but their products are innovative. They are known for their high-quality materials that are durable and reliable. For this reason, their prices are a bit higher as well compared to some other brands. The Thetford 34429 Aqua Magic Style Plus Toilet offers a combination of style and convenience. It delivers a contemporary home-like toilet feel, which makes it ideal for an RV. A beautiful china toilet, this one looks sleek and stylish in pure white color. The seat is a full-size residential seat that also comes with a lifting slot. The size of this toilet is perfect for an adult. It is a high-profile toilet that comes about 35.5 inches high with the seat open. With the seat closed, the height is 17.5 inches. The depth is 25.5 inches and the width 22.5 inches. 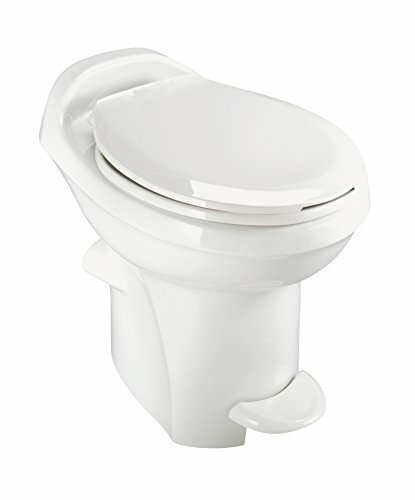 The flush is powerful, cleaning the toilet bowl entirely while getting rid of all the waste effectively. This is something that is very important for RV toilets. To flush, you need to press the pedal all the way through, and for filling it up, you need just to press partially. It is a single-piece flushing toilet with a flush system that works via an ergonomic pedal. The press of the paddle initiates the flush operation, which makes everything easier and more sanitary. It has anti-microbial properties, which prevent the formation of mold or bad odors. The toilet is quite light, weighing just 15 pounds. To install, all you need is to make sure that you have a 3/8th-inch water supply line for adequate flushing. The installation of this two-bolt toilet is a breeze. It comes complete with all the necessary things you need to install it in your RV and connect it with the holding tank. All the guidelines about installing and removing the toilet are present in the user guide in three different languages. Using that guidelines, you should be able to install it in under 30 minutes on your own. This toilet from Thetford is part of the Aqua Magic series, which features both low- and high-profile toilet. This toilet’s main benefit is convenience. It is easy to flush, a breeze to clean, and hassle-free to install. The flush is powerful almost like those found on other toilets designed for domestic or commercial bathrooms. The seat is big enough and has the ability to fight bad odor. Your RV would never stink up because of this toilet. As mentioned, the installation is simple enough too, which means you don't have to call a professional plumber. The height and size are just enough to fit in a compact space like an RV. Even with its compact size, it is still comfortable enough for adults. The pedal flush option makes it convenient for hands-free use. The only problem is that, apparently, the water valve is not quite long-lasting. Also, if you prefer a spray option, you will not get it with this toilet. Let’s compare this toilet with a model from another popular company for RV toilets, Dometic. For this, we have the ​Dometic 320 Series toilet​, which is also a high-profile toilet. It definitely has a different look with more of a pedestal-like base. However, its flush system is exactly the same as the Aqua Magic Style Plus. The seat is a full-style wood seat, which is just as comfortable as the one on the Thetford toilet. However, the latter clearly has more advantage with its anti-microbial properties. The one problem with the toilet from Dometic is that its flush is not quite powerful. Unlike the Thetford power flush system, you may have to use it twice. This means that it is not as easy to clean either. The Dometic toilet is also quite heavier as compared with the Aqua Magic. It weighs 37 pounds whereas the latter is only 15 pounds. That does not mean it uses cheap plastic though. As a matter of fact, it is all porcelain and high-quality. However, weight doesn't make it a good option for RVs. There is a two-year warranty for the Dometic toilet, which is clearly what is missing with the Thetford product. It is also a bit cheaper than the one reviewed here. Despite having a bit heftier price tag, the ​Thetford 34429 Aqua Magic Style Plus toilet​ is highly recommended. Basically, you get the best value for your money. Its flush system is powerful and cuts down on cleaning. The seat is also quite modern and comfortable even with its compact design. Your RV should be able to accommodate it easily. However, it is better to check first when replacing an old toilet. Anyone looking to invest in a good toilet that should last for years should go for this one. Thetford is still a novice name for campers and adventurers, but they are gradually cementing their position by producing cutting-edge toilets. Aqua Magic Style Plus just happens to be one of those. I really like the innovation of the foot activated mechanism. This is a great alternative to standard hand operation that is a breeding ground for germs and bacteria. I am disappointed that there is no hand operation option as being able to have both would be great. Are the options with regards the seat that is supplied with the unit or is this plastic the only option available? Thank you for interesting article on the Thetford 34429 Aqua Magic Style Plus toilet. I must confess I have never heard of Thetford before your article however this looks a great toilet for the price and just looks like one you would have in your own home. I note that you state that this is toilet is ideal for an RV however would you be able to install this toilet in a static caravan. Wow, I did not realize that so much needs to be considered when shopping for appliances for RV’s. Obviously you would want to consider space as well as ease of installation. I especially like how the Thetford model is also lighter in comparison to the Domestic 320. The Thetford 34429 sounds like a great option both in flushing ability and weight. Would this also work for smaller bathrooms in apartments/condos? We would not recommend that you use the Thetford 34429 for smaller apartments bathrooms since it doesn’t come with a P-trap and is just not designed for that. It’s best that you check out these Best Flushing Toilets instead. Hi there Great review. It was very helpful I was looking for a good toilet that not just fits our space but it can save us some water. And if it can get cleaner than a standard toilet it can be better than that. The Thetford toilet looks like it has what we wore looking for and will definitely give it a try.Thank you very much this is a great review about the Thetford 34429 Toilet. Everybody needs a loo and everyone wants one that is efficient, clean and odourless. This is a great review of a couple of different loos. I need a whole new bathroom so I am interested in what you are offering as we only have a small space. I like the look of the Thetford 34429 Aqua Magic Style Plus Toilet, High/White, especially the idea of a foot pedal. It makes it easy for kids to use. Being lighter weight makes it more appealing for an RV but in my home I would prefer the heavier more stable loo. Thank you for an excellent review. Thanks so much for sharing a good and honest review on the Thetford 34429 Aqua Magic Style Plus. My husband and I bought a RV last Summer, it is second hand and I was telling my husband that it would be a good idea to get a new toilet, as he also said it is a good idea, I got the job to do the research to find the right one. I think as it’s winter here in Canada, it’s the best time to do get this job done. As I’m looking to find a good toilet for our new RV, your website called my attention and I will forward this article to my husband, I think I got a winner! I found the article very useful! Thank you! We just move from a big house to a smaller one, and we need a new toilet. The Thetford 34429 Aqua Magic Style Plus look very practical. I like the fact that it’s lightweight, reliable and durable. It’s also affordable, so, I am going to check this further on Amazon. Just a question, please. I see it ship out of the US. How long could it take to receive the toilet? Also, is it possible to know if there is a warranty? If you are looking for a new toilet for your home, the Thetford 34429 wouldn’t be the best option because it’s specifically designed for use in an RV. For better options about home toilets, you may want to check out these best flushing toilets for the home. You can get all the details about delivery time and warranty on the product pages when you click any of the images. The Thetford 34429 Aqua Magic Style Plus Toilet sounds like a really good product for your RV. It looks like it has a super efficient flushing system, compact and stylish, and cleans itself too, amazing. I have a Thetford Fridge in my camper, it works all the time and never misses a beat, I bought this 5 years ago and am very happy with the brand. Generally, if they are good with fridges, they are probably great with other products too. So you do recommend this newcomer to the market even though it has a slightly heftier price tag! When I next purchase an RV I will check out what type of toilet it contains and give the new Thetford 34429 Aqua a go. Thanks for the honest review, it has been great. Thanks for this review on thetford 34439 this is more like a new product in the market the ones I am used to use imperial Oxford toilet seat that has been okay but quite expensive although I really like this thetford it won’t be a bad idea to try a new product it looks more like a better substitute to the previous one I was using. This sounds like a great toilet for anywhere, let alone an RV. I never thought about the type of toilet needed in an RV but this has definitely opened my eyes to the issue. It sounds like this would be a great choice. On top of it, I love the pedal that it has and I love the design of it. Very sleek. Thank you for the thorough review. I am going to pass it along to some of my friends that are into RV’ing.